London Brawling are going back to championships! 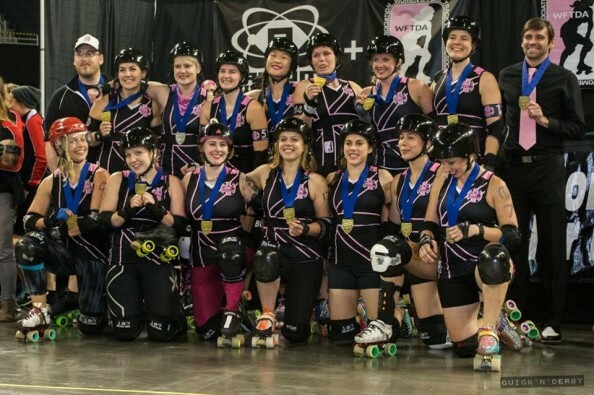 We just qualified as the number 1 seed at playoffs, and we are ready to once again represent the international roller derby community at the top level of WFTDA competition. Now we have the simple matter of raising enough money to get a team to Nashville! There is an ocean between us and the Hydra, and it's an expensive business. Any amount you can donate to help us will be amazing - no matter how small. The rewards are now sold out but you can still donate. Everyone should have received an email with details of how to claim your rewards, if you haven't received this please send an email to backingbrawling@gmail.com as we may have incorrect contact details for you. I am in the UK for work until Nov 22, if I have the shirt shipped to my office address, will at arrive before I head back to the US? If you donate a t-shirt level we will contact you for sizing and shipping info! Ok to assume we will be contacted with shipping costs and size if donated enough for shirt? I donated from my phone and did not see info on either but I wanted to get my support in! Thanks! Also how much is shipping to New Zealand? Last year it was £5 for shipping to the USA, should be the same this year. Do you know how much shipping to the US would be? Can't wait to see our team mate Juke Boxx. Good luck with the fundraising. So proud to be represented by you in Champs 2014 Have a great time and make a big dent in Nashville!